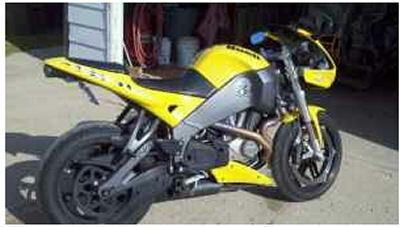 The Yellow 2007 Buell Firebolt XB12r for sale has D&D exhaust, frame sliders, aftermarket brakes and clutch levers, flush mount front blinkers, rear integrated taillight just to name a few of the upgrades. the 2007 Buell Firebolt for sale has had pretty much every modification and custom feature that can be added already done. This Buell motorcycle has it all! The only reason that I am selling the custom Firebolt is because I just bought a new chopper and I don't ride the Buell like I should to keep it running and riding as great as it currently does. You won't find a better deal on a used Buell motorcycle for sale in Iowa, on any other classified ad sites, on Craigslist or in an Ebay auction so hurry and make an offer before it gets away from you! Strike Lightning would also encourage bikers to submit a review of the 2007 Buell Firebolt XB12r For Sale to make the biker community aware of any problems that are commonly associated with the old Honda or to highlight its positive features and help potential buyers make informed decisions.